Larus michahellis atlantis (Canary, Madeira, Acores islands). 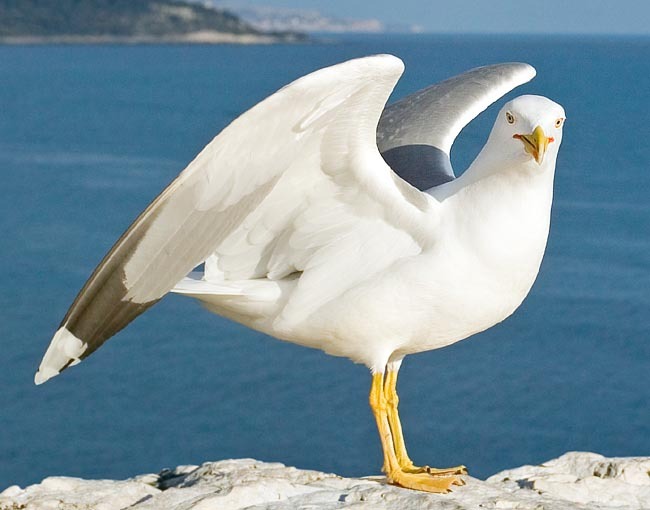 The term indicating the genus “larus” comes from the Latin and simply means “gull”. The term indicating the species “michahellis” comes from the name of the German zoologist Karl Michaelles to whom this species has been dedicated. The zoologist Karl Michaelles was known for having studied, during his short life (1807-1834), also many species of birds. The yellow-legged gull is abundantly present in the Mediterranean basin; especially, but not only, along the coasts. It is mainly, but not only, a European species: is present also in North Africa with variable densities and expansionist movements (it has recently reproduced in Libya and in Egypt). Its range gets to the Middle East with the presence of nesting pairs in Syria, Israel, Cyprus and Turkey. Coming back to Europe, it goes northwards on the coasts and the islands of the Atlantic; is present also on the French and Spanish Atlantic coasts. It nests also in the western zone of the Black Sea where it overlaps to the range of the Caspian gull (Larus cachinnans) of which, in a recent past, it was considered as a subspecies. 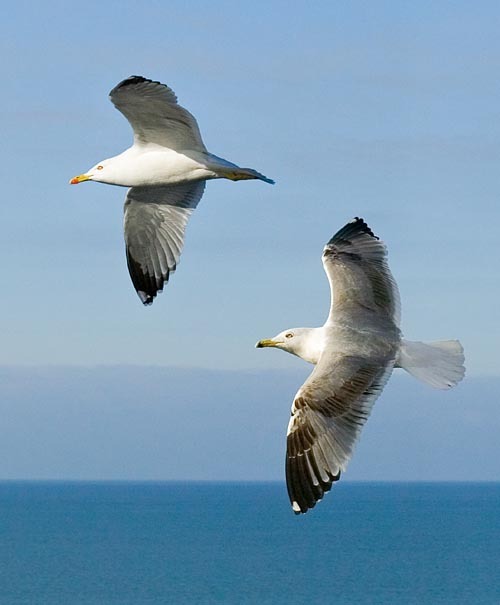 The two species, even if present at the same time, frequent different habitats: the yellow-legged gull prefers the reefs and the raised areas; the Caspian gull loves the coastal flat habitats. The yellow-legged gull is an expanding species which is spreading northwards in central and Western Europe; some pairs have arrived in South England forming even hybrid pairs with the Larus fuscus. 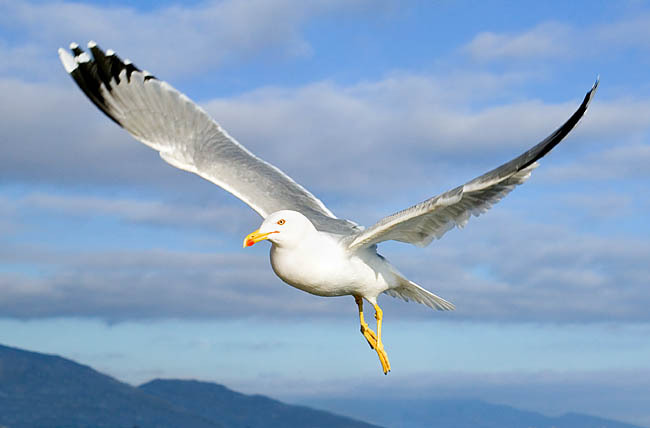 The yellow-legged gull is a sedentary as well as migratory species. The migrations happen for hibernating in the temperate zones; by late summer there is also a dispersion of vagrant specimens, a little bit in all directions, with sporadic sightings of animals even out from the usual range. The yellow-legged gull is a typical frequenter of the coasts and of the marine reefs, but it often goes, without any problem, inside the mainland along rivers and near lakes looking for food and for reproducing; for instance, in Italy it reproduces on some steep and rocky sections of the Garda Lake. It has adapted to the presence of the man and of his dwellings getting to exploit them to its own advantage for finding the food, for living and even for using new artificial sites of nesting. For above reasons, in some zones, it is frequently seen while sharing the same habitats of the black-headed gull (Chroicocephalus ridibundus). The yellow-legged gull has been considered as a species on its own and effective just recently. Until a few years ago, it was considered as a subspecies of the Caspian or Pontic gull (Larus cachinnans). Thanks to the modern technologies of genetic investigation, the comparison of the DNA of various species belonging to the genus Larus has not only evidenced that the yellow-legged gull is a species on its own but that even has greater genetic affinity with the Larus marinus and the Larus armenicus than with the Larus cachinnans which is, in turn, more related to the Larus argentatus and to the Larus fuscus. The yellow-legged gull is bird of discreet size having a length from the 50 to the 70 cm, a wingspan from 120 to about 150 cm and a weight varying from 550 to 1600 g. Even if both sexes do have same livery, females are usually smaller than the males. The yellow-legged gull has a solid and proud appearance; the upper part of the trunk, back and most of the wings has a definite grey colour. The wings are, for the most part, edged of white (the rear edge is wider and longer than the fore one) and end in an ample black tip interesting the primary flight feathers. The tips of the black portions of the primary flight feathers end with some small roundish spots of white colour which form a sort of a marking standing out from the black with open wings as well as closed. Seen ventrally, the wing has the colouration of the tip always dark-blackish but duller; after the tip there is a pale greyish portion. The remainder of the underwing, more ahead, is whitish. The head, the neck, the short initial trait of the back, the chest, all the ventral part of the body, the tail and the over-tail are white. The eye has yellow iris which confers an aggressive expression to the gaze. The eye is surrounded by a fairly evident periocular ring of red skin. The bill, 5-6 cm long, is solid and ends in a quite crooked bit; it is yellow and in the lower rhamphotheca near the point presents a showy red spot. In correspondence to the red spot is present a small ventral protuberance. The red spot serves as stimulus for the pullets who beak it insistently for inducing the parents to regurgitate the food and therefore nourish them. Red is also the thin inner commissure at the base of the bill-mouth. The legs are of a nice intense yellow and are so much typical of this species that the common gull, in English, is commonly called and identified with the name of “gull with the yellow legs”. 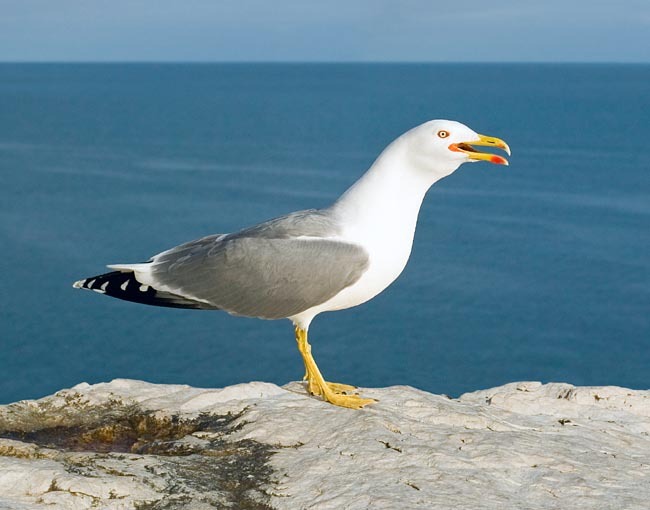 This gull emits a cry resembling to a human laughing, very deep and noisy at the same time. During the winter, the livery has a colouration similar to the summer one but only less bright and definite also due to the presence of slight brown-greyish hoarfrosts-stripes on the head. The young of the year has brown-greyish colour with dark scaly drawings covering practically all the livery. Such colouration is more marked on the back and the sides of the body and is lighter on the head, neck and chest. Also the flight and tail feathers are fairly dark (dark brown-blackish). Always in the young, the iris is brown-dark, the legs are grey-pinkish, the bill is black. The brown colouration of the young will gradually reduce and the definite and final adult livery will be reached by the fourth year of age. The yellow-legged gull may be mistaken with the European herring gull (Larus argentatus); this one has the grey dorsal parts paler, a look somewhat more squat given also by the shorter legs which are pink, the white spots on black background of the tips of the wings are bigger. In winter, the European herring gull has the head more striated of brown. The young of this gull are more homogeneously brown-dark than the young of the yellow-legged gull. This can be mistaken also with the Caspian or Pontic gull (Larus cachinnans) of which it was, as already said, considered in the past a subspecies. The Caspian gull has elongated body and neck, thinner bill, rounded head, dark eye and pink yellow legs and has, altogether, a more graceful and slender look than the yellow-legged gull. The yellow-legged gulls, like the other species belonging to the genus Larus, have a piscivorous alimentation tending to the omnivorous. They are able to take advantage from the more disparate sources of food, nourishing of urban alimentary leftovers and near the dumping sites. 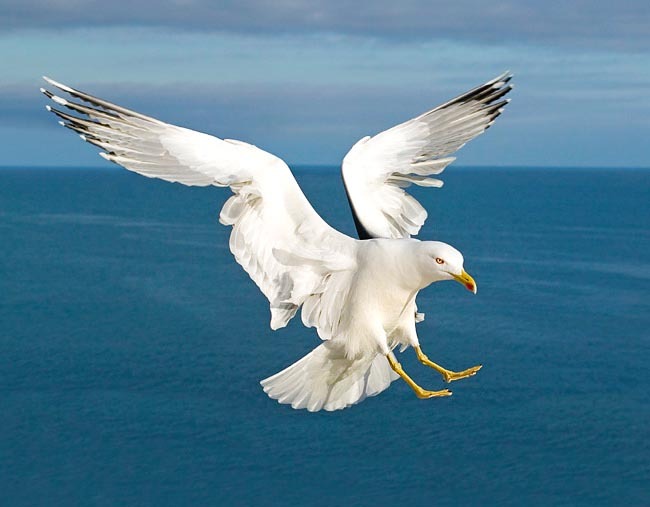 They have also the habit of stealing the food fished by other species of gulls and various marine and aquatic birds, chasing them, bothering them heavily and obliging them, finally, to regurgitate or to drop from the bill the preys they have caught. They nourish also of eggs and pullets and can actively hunt some small animals. Being intelligent birds, they are in condition to take advantage in the best way of new trophic source even adopting innovative searching and hunting techniques which then will be culturally transmitted to the conspecifics. It is recent, for instance, the acquisition of the technique of “hunting the common swift (Apus apus)” in some cities. They nourish without problems also of carcasses of animals dead in incidents or deceased for various other reasons. The yellow-legged gulls have colonial reproductive tendencies. The nest is formed by a mass of vegetal material. The nesting may happen on the soil if the habitat is deemed safe, or, it more frequently happens on the rocky ledges and on small inaccessible terracings placed on reefs and ravines. Some pairs-colonies have begun to nest on the roofs of dwellings and of buildings of various kind also in habitats strongly anthropized and relatively distant from the sea. As an example, the yellow-legged gull nests regularly over the buildings, the canopies and whatever other overhead structure considered suitable inside and in the surroundings of the bio-park of Rome. Inside the zoological garden, the birds find also the food for their own newborns directly from the enclosures of the animals hosted at the zoological structure of the city. The brood is usually formed by 3 brown-greenish brown-spotted eggs. The hatching lasts about one month (27-31 days) and the nest is strongly and fiercely defended by the pair who doesn’t hesitate in attacking, besides the animals, also possible persons getting too close. In these cases, when they feel that the brood is in danger, unleashing rapid attacks from above. They hit the predator, or presumed as such, trying to take him by surprise from behind, on the shoulders and from above with strikes with the beak given utilizing the powerful and sharp bill. The pullets, which upon their birth are semi-precocious, come to life with open eyes and are able to walk since the first days of life. They actively and noisily require the food from the parents, and this, once regurgitated by them is swallowed in large mouthfuls. When newborn, they have a brown-yellowish colouration spotted of brown and will be able to leave the nesting site, performing their first flights, when about 35-45 years old; they will be, in any case, followed and nourished by the parents still for some time. Very common in the Principality of Monaco, in 2013 the Larus michahellis has had the honour of being represented on a stamp.